Usually (unless contra-indicated) I like to use essential oils to enhance the massage experience. These oils have specific healing properties. A few drops of these wonderfully aromatic oils are blended into a carrier oil and gently massaged into the recipient’s body. The oils are absorbed into the client’s bloodstream via the skin and respiratory system. An aromatherapy massage is a delightful sensory experience with the benefit of detoxification, deep relaxation and the healing properties of the oils. Each essential oil has its own fragrance, therapeutic properties and chemical makeup. I create a blend of oils whose natural ingredients will act together, to bring about a beneficial range of physical, emotional, spiritual and psychological effects on the body. 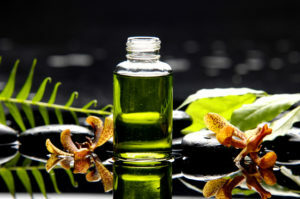 Essential oils can be applied through bathing, inhalations, compresses and massage. (Essential oils are powerful and concentrated: they should never be applied to the skin in their undiluted form.) Essential oils are also absorbed when inhaled through the nose. The lighter molecules of the blend are inhaled and act on the olfactory bulb, located next to the emotional centre in the brain and the naturally occurring chemicals of the essential oils are drawn into the lungs and can also supply physical benefits.